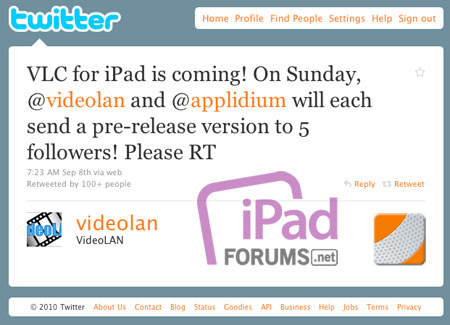 Discussion in 'Apple iPad News' started by JohnnyApple, Sep 9, 2010. We can only hope that the VLC App that was submitted to the app store this morning will get a quick approval. A group called Applidium is working with the VLC group to make this app a reality. What exactly is VLC? VLC is short for Video Lan Client, a very popular and cross platform video playing tool that can pretty much handle any type of file/codec that you throw at it. It works great on Mac, Windows and Linux and we can hope that the stability in the iOS platform is just as good. We recently told you about CineXPlayer but we think VLC has the potential to be even better. Wow, this would be a great app on the iPad.. Hmm.. I just wonder what the chances are Apple will reject it? - Easily wifi transfer to download media files from your PC to your iPad. - Support FTP Client to download media files to your iPad. - Build in web browser to download media files. - Support ".sub" subtitle, if you only have ".srt" subtitle file, you can use Text2VobSub to convert ".srt" file to ".sub" file. Have used It daily for a while now and It's a great stable player. sweet. That looks pretty cool. Will this puppy solve the Flash problem ? No, unless you have an exact link to the FLV....I'm pretty sure it can play them. I personally use Air Video for all videos tho...I don't find a need for them to take up space on my iPad when I can stream them at awesome quality over the internet. And VLC won't play HD MKV files....so air video is still the way to go. This might be good tho if it can play safari video links.